Please be aware that a competent veterinary diagnosis and advice is extremely important, whether you use anything in your first aid kit or not. 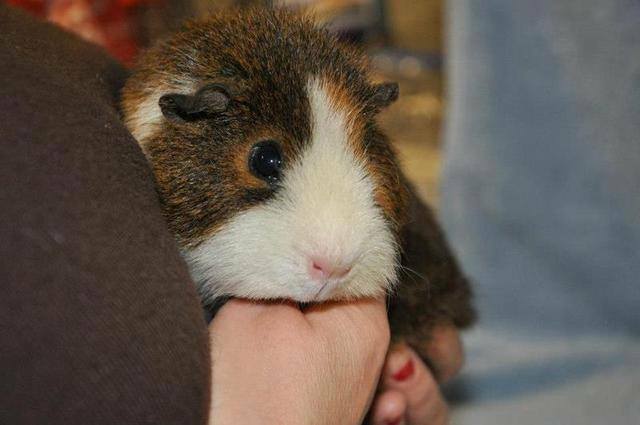 Please make sure you have registered with a good vet - don't wait until you actually need the vet to find out whether s/he is experienced enough in guinea pig medical care to save your guinea. Used for: All poorly piggies. Example Products: Tesco Chewable Vitamin C 200mg, Oxbow Daily C.
Ill guineas need a minimum of 50-100mg Vitamin C a day. Especially if they are not interested in eating, supplementing is well worthwhile. Find a Vitamin C supplement with as low a dose as possible to allow you to dose accurately. Used for: Guineas who are not eating normally. Please do not attempt to syringe-feed your guinea pig if s/he is bloated; a blockage must be ruled out urgently to allow safe and appropriate treatment and feeding to commence. Example Products: Oxbow Critical Care, Science Recovery. A guinea who is not eating at all will need feeding little and often, amounting to an absolute total minimum of 60-120ml per day. It is also appropriate to soak and mash your guineas normal plain pellet feeds (e.g. Burgess Excel, Science Selective, Wagg Optimum etc.). Used for: Piggies with digestive upsets, particularly diarrhoea; Piggies on antibiotics. Example Products: Protexin Bio-Lapis, Fibreplex, Pro-C Probiotic, Avipro Plus. Acidophilus powder or “poop soup” (faeces from a healthy pig mashed and mixed with a little water) are just as adequate. If giving a probiotic alongside antibiotics, leave 1-2 hours after the antibiotic dose before giving the probiotic. Used for: Cleansing and flushing a variety of wounds. Used for: Cleaning the ears, which can help to prevent ear mites. Example Products: Otodex Veterinary Ear Drops (for cats and dogs), Johnson’s Ear Drops. Apply 2-3 drops to the folds of each ear, massage in well, and leave for up to 24 hours to soften the ear wax. Using a flannel or cotton bud, gently cleanse out the visible flaps and folds of the ear. An alternative product to use is 2-3 drops of mineral oil. Used for: Rehydrating guineas suffering diarrhea and mild heatstroke. Example Products: Dioralyte (plain or blackcurrent flavour). For example you have 200mg vit c tablet but you need to give 25mg dose and you have a 10ml syringe of water. You can use this method for other medicines and doses.